At Roto-Rooter, our plumbing services extend beyond fixing sewer pipes and fixtures in your commercial business building. In addition, our team is also experienced at installing new water heaters and replacing traditional water heaters with more efficient, tankless ones. Tankless water heaters have become increasingly popular over the years because they can heat the water without using a storage tank. Because they don’t have a storage tank, tankless water heaters avoid the standby heat losses associated with storage water heaters. When a hot water tap is turned on in a tankless water heater, cold water travels through a pipe into the unit. In an electric tankless water heater, an electrical element heats the water. In a gas-fired tankless water heater, a gas burner heats the water. As a result, a tankless water heater delivers a constant supply of hot water. You don’t need to wait for a storage tank to fill up with enough hot water. A huge benefit of tankless water heaters is that they reduce your water heating costs because they heat water on demand rather than keeping stored water hot all the time. They can also run all day if needed, never leaving you with a cold shower because they heat the water on demand. You don’t have to wait for the tank to fill and heat up on a tankless water heater. Tankless water heaters also offer the safety option of setting your water temperature to a reasonable level that reduces the risk of scalding, which, unfortunately, plumbers see a lot of. Using a lower temperature also reduces your energy use. These water heaters also tend to handle hard water and the associated minerals and sediments better than conventional storage tanks, which makes far less likely to leak or rupture. 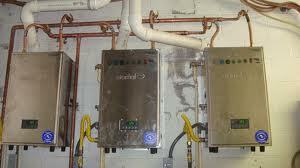 Because of this tankless water heaters have much longer warranties and have a typical lifespan of more than 20 years. This saves water by allowing it to heat instantaneously, avoiding the need for the water to be left running in order to heat up, as is usually the case with traditional water heaters. Since water is an important resource in California, we are proud to share equipment and services with our customers that will enhance their daily routine. Call Roto-Rooter To Install & Repair Tankless Water Heaters Today! Count on your plumber to provide you with advice about choosing the tankless water heater that will suit your needs. And make sure you use a plumber to install your appliance. Count on Roto-Rooter to provide you with help in all areas of plumbing, including septic repair, drain cleaning, toilet repair, sewer line repair, water heater repair, faucet repair and as an emergency plumber as well. Contact Roto-Rooter Ventura County at (805) 620-3700 for all your plumbing needs.